The subacromial bursa is a fluid filled sac that cushions and reduces friction in the space between the rotator cuff tendon of the shoulder and the acromion process of the scapula (see picture). When you raise your arm above your head this bursa and the rotator cuff tendon can become pinched between the humeral head (ball of the shoulder joint) and acromion. If done repetitively, this can cause swelling and pain within the bursa and the rotator cuff, a condition known as shoulder bursitis or impingement syndrome. What are the signs of Shoulder Bursitis AND Impingement? Pain with overhead activity is the classic sign of shoulder bursitis/impingement, but one may also experience pain when lifting objects, sleeping on the affected shoulder, or pain that begins in the shoulder and radiates partway down the arm. There are many possible causes to Shoulder Bursitis/Impingement, but the classic cause is repetitive overhead activity such as painting a ceiling or sports such as tennis, swimming or volleyball. But in many cases there is no true cause, and the symptoms come about gradually from regular wear and tear. Genetics likely play a role and anatomical variations in the shape of the shoulder or the presence of a bone spur under the acromion can lead to this problem. Mild cases of shoulder Bursitis/Impingement can be successfully treated with rest, anti-inflammatory medicine such as Ibuprofen or Naproxen, and avoiding overhead activities which cause impingement of the bursa. Sometimes, a corticosteroid injection into the inflamed bursa and physical therapy are needed for more refractory cases that are not relieved by rest or over the counter medicine. Surgery may be required for more severe cases that do not respond to the above mentioned treatments, and in particular for patients who have anatomical differences such as an acromial spur or a downward sloping acromion. 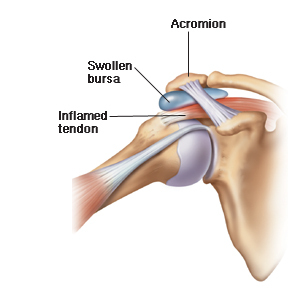 The surgery may involve a subacromial decompression where the inflamed bursa is removed and/or an acromioplasty where the bone spurs are shaved down and the acromion is reshaped to give more space to the rotator cuff tendons and bursa. The surgeons at the Raleigh Hand Center can perform this procedure using arthroscopic minimally invasive surgical techniques. If you have shoulder pain or feel as though you may have signs of impingement syndrome, feel free to call our office to schedule an appointment with one of our fellowship trained Orthopaedic hand and upper extremity surgeons. Article by Dr. George Edwards, III, MD.